In its second round the El Gouna Film Festival (GFF, 20-82 September) is paying tribute to the legendary Egyptian filmmaker Youssef Chahine, to mark ten years since he died. A special programme features a screening of his newly restored masterpiece The Emigrant, an exhibition of posters and paraphernalia and, most remarkably, a short montage of Chahine scenes by filmmaker Amir Ramsis (also artistic director of GFF) to accompany a live performance of Chahine film scores recomposed by the celebrated composer-conductor Hisham Gabr. The project of recomposing film music is happening for the first time in Egypt, though this is not the first time Gabr, who was recently awarded the Order of Arts and Letters from the French government, has reinvented popular music: last July he opened the Baalbeck International Festival in Lebanon with two medleys from Oum Kalthoum’s most iconic songs, newly recreated. With Chahine the task is doubly hard because Gabr must also incorporate the visual experience into this concept. 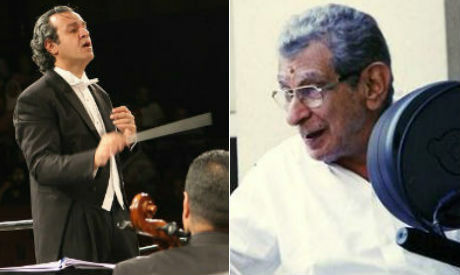 According to Gabr, reintroducing Chahine’s film music was initially an idea of the film producer and director Marian Khoury, Chahine’s nephew and the co-director of the production company he founded, Misr International Films. “It’s been two years since Khoury and I talked about the idea for the first time. It was not clear when or where this idea could be implemented, in France for example or at the Cairo Opera House, or perhaps for the 10th anniversary,” Gabr commented. When GFF decided to celebrate the latter Khoury proposed the idea to the festival administration and it was welcomed. In addition to the film scenes, however, the visuals will also include photos of Chahine on locations. Sound bites from interviews with Chahine will be also be incorporated into the soundtrack. One of the challenges inherent to such a project, Gabr explains, is how the music, not the image is its core. The selection of films depends on a range of factors. One is the space given to music in the film. Most of Chahine’s later films, especially The Emigrant (1994) and Destiny (1997), had a very large musical component. But there are also earlier films like The Land (1969) and The Sixth Day (1986) that boast strong and pervasive scores. With a focus on songs, indeed, The Return of the Prodigal Son (1976) was more like a musical. Gabr’s approach is not so much to create a presentation of music in the different stages of Chahine’s cinema but to reflect the best in each stage by mixing various ideas and approaches into a newly forged whole. Part of the difficulty Gabr faces is that many of the tunes and musical themes in question are extremely familiar in their original format. “Even though Chahine’s work was only admired by a certain group most of the time, those who loved his work really believed in him and made him very widely influential. So a lot of people are familiar with his films’ original music and songs. And when something is already well known and loved it is always difficult to reintroduce it in a different but still appealing way,” Gabr explains the magnitude of his task. He needs to keep the spirit of the original music, present a coherent composition out of various, unrelated fragments and songs, and sync the resulting music to visual material. “I tried to think of the context of why this piece of music was created and to stay on the same track as the motivation behind creating the music in this or that scene,” he explains. Indeed Oriental instruments like oud, qanun and percussion have been incorporated into the symphony orchestra, together with a singer from the Cairo Opera House to perform extracts from the songs live. For Gabr part of the draw of this project is the chance to tackle some of the finest Egyptian music by some of the most talented musicians in recent history. Chahine was not dogmatic, whether in his personal life or in his creative work, and his choice of music reflects how open he was to different styles and ideas. That is why the role of music in his films changed dramatically from one stage to the next. He was often dealing with song writers rather than film score composers and this made a difference. In some songs he let actors including himself sing. For his part Amir Ramsis is concerned with reconstructing the scenes, photos, and interview extracts to make them fit the music coherently. “We are putting together a short story on the music in Chahine’s cinema, sometimes incorporating the voice of Chahin himself,” he says.